Hakija, is an opensource(free with source code available) NSE End of Day Data Downloader written in Python. No other installations like .NET framework, Java anything else is required. It downloads daily EOD (End Of Day) data as well as historical data (past EOD data) for the NSE EQ series and also the main indices (‘NSENIFTY’,’NIFTYJUNIOR’,’BANKNIFTY’,’NSEMIDCAP’, ‘NSEIT’,’NSE100′,’NSE500′,’MIDCAP50′ and ‘VIX’). If you choose to download only the bhavcopy data or just a few of the indices, the other can be downloaded later without any need to redownload the previous data. The data is directly downloaded from the NSE servers and can be directly imported into MetaStock or AmiBroker as ASCII format. The data is downloaded in the same directory as the program itself. Why Algo Traders Stay Away From Traditional Trading Platforms? The so called Quant or Algo traders prefers to stay mostly away from Traditional trading platforms like Amibroker, Ninjatrader, Metatrader, Metastock, Tradestation etc. Do you know why? Thanks for finding this utility and posting it here. I was looking for an alternative to GetBhavCopy. It downloads VIX data as well…. can it download data in realtime into excel sheet. how to make connection both. will it adjust splits etc? Can you eloborate on how to handle the Hakija software and where should I save the data and how can use the saved data to view on Amibroker?please kindly help me. 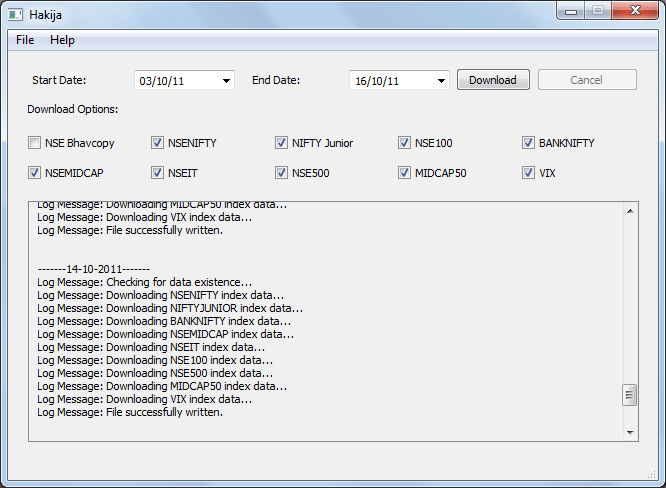 I tried to download the data of NSE with Hakija, but unable to get it, Kindly guide what to do . I have windows 7 with 64 bits. Thank you very much for excellent work. Is it possible to get Audibal alarm when signal is triggered?. I am using your system for last two days only. What the horizontal bar (red, green) at the bottom indicates? I have downloaded Hakija & saved in Download folder. how to link to amibroker? Pls guide as I want to get trained in chart reading on EOD basis. I downloaded haikja but is not working with amibroker I have standard version. . not registered. plz guide me properly how to solve this problem. .
it is not dnloading metastock data after18 july 2016. Hikija is not downloading the data since many days. Need your assistance.